This cabin was love at first sight. It is not a giant mansion or a castle. It is not a high-tech modern villa. Instead, Sea Sound Cottage is a cute, cozy, camp like location on a bluff just East of the Moclips beach. A true cottage in the perfect place for a true cottage. And if you like to dig Razor Clams you will be in seafood heaven. Much of the home has been updated and then furnished with comfortable furniture, new beds and bedding and everything to make it more homey than any old mansion or castle. The kitchen has the pots, pans, knives, refrigerator, freezer, stove and oven, toaster and pretty much everything you need. Enough for a week or weekend stay. Plates and silverware too of course. Paper products are supplied. There is television and internet if you really must spend time staring at a screen. But perhaps the children will prefer to walk to the beach (you do have to walk or drive). There everyone can jump the waves, search for shells or just stroll up and down looking for whatever the sea brings in. Sea Sound Cottage is affordable and that is not just a slogan. Families with kids can afford to stay for longer periods, or bring their pals along too. Children will not feel pampered in a cottage, but they will see the wonder being so close to the trees on the western side of the house. There is a peak-a-boo view so you may want to spend hours just sitting on the deck listening to the sea sounds. What if you want to do more things? Nearby is the gourmet Ocean Crest restaurant, or you can drive to Seabrook for food. Venture further South to the bustling village of Ocean Shores where you will find yet more food, horse back riding, bowling, scooters, gift shops, book stores and more. you saved by renting the affordable Sea Sound cottage! But after all the fun, after seeing all the sights, it is fair to say you will appreciate the quiet, romantic sea sound cottage you may be even more delighted to arrived back at the comfortable, cozy and romantic cottage, where you can doze off listening to the Sea Sounds. Booking one of our properties in Moclips? In this little community, you'll find an array of seaside activities for you and your friends/family to venture into. During the Spring and Summer, you'll be able to bird watch or go crabbing. If it's warm enough, take a surfing lesson or go fishing so you can catch something for dinner later! Our families lives a 12 hour drive from the beach. Yes 12 full long and winding hours. And yet, we travel frequently to our Sea Sound Cottage because, well because it offers the kind of relaxation, comfort and joy most people do not get daily at home. We chose this spot because we wanted to hear the sounds of the ocean, to smell the beach air and yet to be easily accessible. We chose the cabin because its just the right size for our small family and children. There is room for everyone and yet we are all there together. In the morning, sitting on the deck with a cup of coffee starts the day off perfect. Some days it is difficult to leave the deck, but a walk to the beach is required of course. Everyday there is something new to find and discover and explore. The kids fill buckets and the adults fill memories. We look forward to many years of delight at the beach. And we are so happy to invite other families to come and enjoy our sea sound cottage just as much as we do. 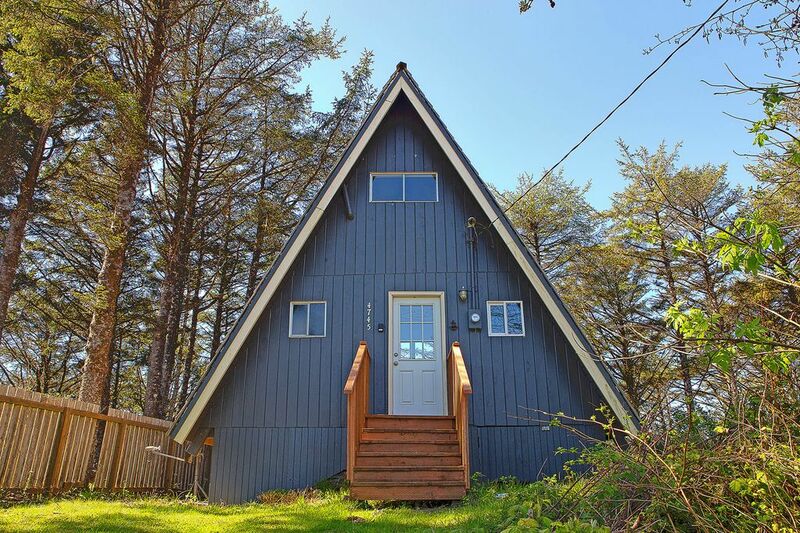 This cute little A-frame is conveniently located in Moclips, close to all North Beach activities. Beach access is 1/2 mile, PO & Store are w/in walking distance. Secluded large back deck w/peek-a-boo views of beach, surf and sea through the Spruce forest. Freshly renovated. Check-in/out and key access is a breeze. This is a cozy A-frame house right of the hi-way, overlooking the ocean about a quarter mile away. The house is small and clean. Don't expect a "resort" type house, because you're not paying for that. Because of its size, the room is a bit cramped for more than 3 to 4 people. The house is very clean, lots of towels, working TV Satellite, etc. Be careful parking on premises, it's a steep hill. Overall, I'd say its a good value for the price. The place was great, gorgeous view, constant sound of crashing waves, well stocked and would recommend it to others. Great place off the main road with an ocean view and always the beautiful sound of crashing waves. This place came well stocked with loads of towels, soaps, dishes and linens. Nice quiet place. Close to the beach. Secluded from other travelers. Lots of open space. Nice view of ocean from the deck thru the trees. we got to see cute lil chipmunks and raccoons on and off deck. kitchen is fully stocked with every thing we needed to cook and clean for 5 days. except food, coffee ect. a short drive to the beach. The beach was really beautiful, clean and PRIVATE!! a very short drive to a bigger town ,to go out to eat .Go to shops and see other beaches. 30 minutes drive to ocean shores for more tourist type activities like bumper boats shops and restaurants.